Injuries, extended illnesses, immune deficiencies and other physical challenges prevent a student from physically being able to attend school. School districts try to accommodate these special needs by working providing on-line courses, in-home tutors, special busing, videoconferencing and more. But these are expensive and very limiting since students miss out on the classroom experience and social life that comes with attending school. Now, they can participate in classroom discussions and share in the social aspects of locker-side chats, lunch period and moving from class to class. At VGo we love putting the spotlight on Lyndon Baty, a high school student in Knox City, Texas who has an illness that requires him to remain at home because of the risk of physically being in class. He’s a perfect example of type of student who benefits greatly by being able to “attend” school via his VGo – or “BatyBot” as its affectionately known at Lyndon’s school. From the safety of his home, in the morning, Lyndon gets on his computer instead of the bus. He uses VGo to move around school, interact with teachers, chat with his friends between classes and spend the lunch period with them without endangering his health. 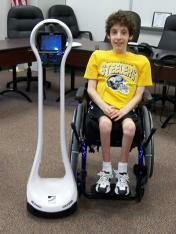 Lyndon operates his VGo simply with an internet-connected computer equipped with audio capabilities and a webcam. VGo runs for a full school day before needing to be recharged. VGo for Remote Students has opened up academic and social environments to other disabled and immune-deficient students as well. There are no longer boundaries between them and the world that was previously inaccessible. 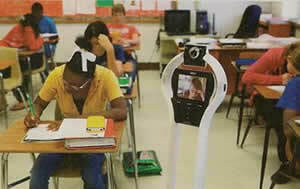 Learn more in an NBC Today Show segment about how VGo enables Lyndon Baty and other remote students to attend school. Click here to download a white paper about how VGo enables students with special health needs to attend school.